Broadcasting and National Heritage Senator Pervaiz Rashid has said that Pakistan on both sides of the Kohala bridge, will be indentical and similar after victory of PML N in upcoming Azad Kashmir elections due to similar development model there. Barsala, the minister said that time has come to put AJK on path to progress as well as prosperity and Khyber Pakhtunkhaw like situation should not arise here. and on the one side was Pakistan and on the other side AJK. He said on both sides are part of Pakistan but unfortunately there was marked difference between the two sides as far as development was concerned. while Kashmir had remained backward and Kashmiri brothers have to go there for better jobs, business opportunities, health and education facilities. on both sides of the Kohala bridge, will be indentical and similar. not even 10 per cent of the funds were spent for the progress and development of the state, he remarked. their Prime Minist Ch. Majeed as to where he has spent the huge amount provided to him. Performance of the PML N past and present governments was clear to all and people of AJK can judge by themselves where was the model of good governance, he said. The minister said that Musharraf gave the nation the problems like terrorism and sectarianism, whereas the PPP misappropriated the development funds. He said that PML N came to power at centre and the Punjab where march towards progress was going on, terrorists were being eliminated, network of motorways which also crosses from Kashmir, was being built to link Gwadar with rest of the country. 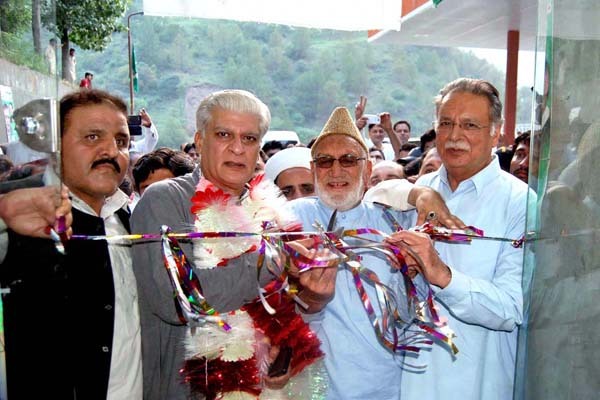 power, Held Srinagar will get the impression that party of Quaid e Azam was in power, both in Pakistan and AJK. come to AJK for celebrations of the victory.